Volkswagen recommends having the battery changed by a qualified workshop. The battery is located on the rear side of the vehicle key underneath a cover. Fold out the key bit of the vehicle key . Remove the cover on the rear of the vehicle key in the direction of the arrow using a suitable object, e.g. a coin . Using a suitable thin object, lever the battery out of the battery compartment . 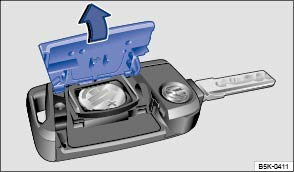 Insert the new battery as shown and push it into the battery compartment against the direction of the arrow . 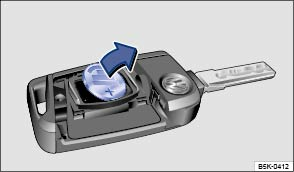 Fit the cover as shown and push it onto the vehicle key housing against the direction shown by the arrow until it engages. The vehicle key can be damaged if the battery is not changed properly. Unsuitable batteries can damage the vehicle key. Replace discharged batteries only with new batteries of the same voltage rating, size and specification. Ensure that the battery is fitted the right way round. Dispose of discharged batteries in accordance with regulations governing the protection of the environment. The battery in the vehicle key may contain perchlorate. Please comply with any legal requirements and regulations when handling and disposing of these batteries.